Do you want to explore the world, experience new cultures, meet tons of new people and make life-long, lasting friendships? Are you between the ages of 15.5 and 18? If you answered yes to these questions, the Rotary Youth Exchange program could be just what you've been looking for. Students learn a new language, discover another culture and live with host families for a full academic year. Become a global citizen. Start in 1 of more than 100 countries. Exposure to different cultures ranks as one of the most powerful ways to promote international understanding and peace. Worldwide, the Rotary Youth Exchange program provides thousands of young students with the opportunity to meet people from other countries and to experience new cultures, planting the seeds for a lifetime of international understanding. 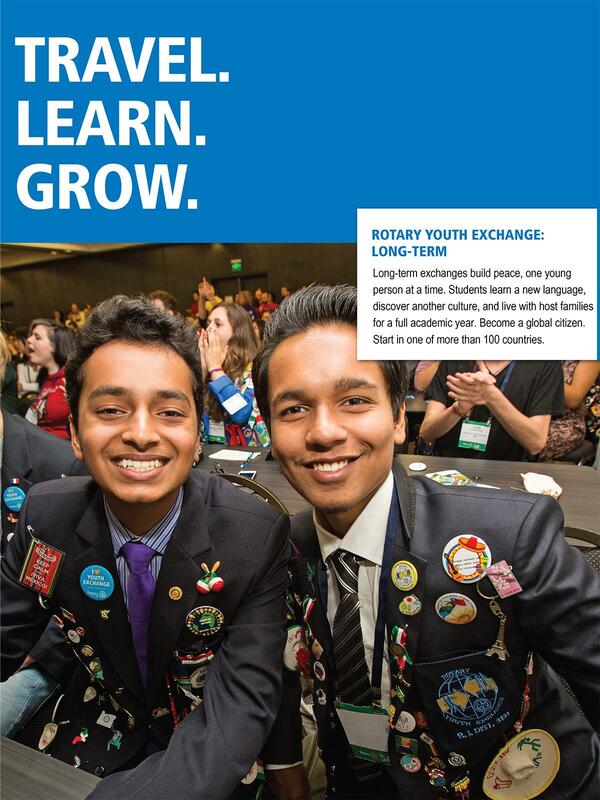 The Rotary Youth Exchange program offers numerous benefits to its young participants and their Rotarian hosts and mentors, as well as to the community at large. Through Youth Exchange, students learn firsthand about all aspects of life in another country. As their concept of the world expands, they mature and develop a deeper understanding of themselves. Immersion in another country’s educational system enhances their academic and personal growth. Host clubs and families and the entire community are enriched by extended, friendly contact with someone from a different culture. These exchanges usually last one year, during which the student lives with more than one family in the host country and is required to attend school there. Long-term exchanges may be extended to include part or all of the holiday/vacation periods immediately before and after the academic year.